Moving to another state doesn’t mean you have to trade off your favorite sports team. 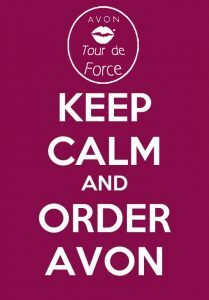 You just have to find a new way to show your support. Thanks to Bottles Be Glowing, you can do just that! 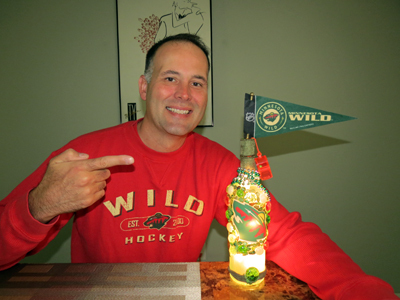 Jessie from Bottles Be Glowing has created several NHL hockey lighted bottles and when I read that she was planning to put together a MN Wild one, I was eager to get my hands on it. Anticipating how she would put it together was more than half the fun! This was brilliant! 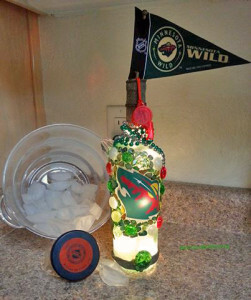 The frosted glass looked like an ice rink and the Minnesota Wild logo was prominently displayed in the middle. By adding color matching bling and a pennant with whistle to top it all off, the whole hockey theme was complete. Mesmerized but still of sound mind I quickly claimed the lighted bottle before someone else did. When you have as many fans as the Wild do, you have to act fast on something like this. I would have never forgiven myself if I had let this one slip by. 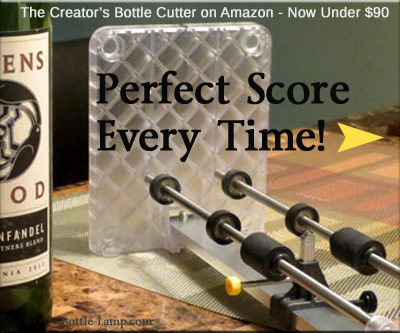 Shipping and receiving – I have to share with you my experience while purchasing this bottle. To sum it all up it was fantastic. The minute I submitted my payment I was told when my bottle would ship. The next day I received an e-mail with the tracking code so I could follow its progress. When it arrived I felt like a kid at Christmas again. The same care and attention to detail that had gone into creating this unique one of a kind item had been given to the packaging as well. The bottle was carefully wrapped in bubble wrap and filled in with air bags on the sides to prevent it from moving around inside the box during transport. I didn’t waste a second and immediately plugged it in. Silke and I stepped back and marveled for at it for awhile. I’m telling you from first hand experience that when you purchase something from Bottles Be Glowing you will not be disappointed. More than the item itself you will be receiving a hand crafted item that is handled by the person who made it from start to finish. 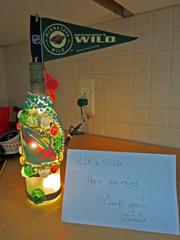 I have another bottle of my favorite NFL team also from Bottles Be Glowing and the same quality and care has been consistent with both. 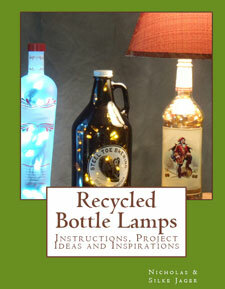 If you would like to check out more bottle lights from Bottles Be Glowing be sure to “Like” them on their Facebook page. 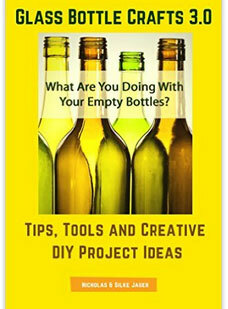 You can also see more of the bottles on the Etsy store. 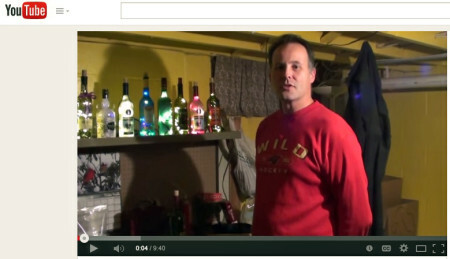 I just realized that this was the shirt I was wearing when we made the “How to make Bottle Lights *DIY Wine Bottle Light*” video!